We feel for our fellow pet owners who have experienced financial hardship as a result of the government shutdown. To help ensure pets remain fed, healthy and in their homes during this time, Purina is offering a pet food and litter donation to our 47 Purina Shelter Champion partners across the country, our national pet food distribution partner Rescue Bank and to the Humane Rescue Alliance’s Pet Pantry program in Washington, D.C. for distribution to federal employees. We understand many of our pet welfare partners are experiencing increased requests for pet food assistance in their communities, and our hope is that this donation enables our partners to support pet owners and ultimately helps keep people and pets together. Purina partners that opt to participate are eligible to receive a donation of Purina ONE dry dog and dry cat food and Tidy Cats litter. Donation quantities are based on each organization’s needs and storage capacity. 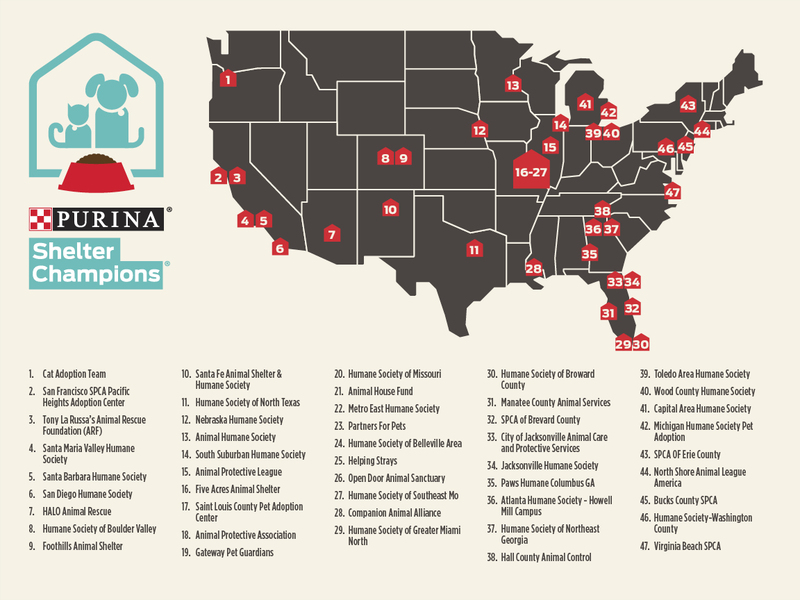 The attached map shows the full Purina Shelter Champion network, and a list of all participating shelters will be updated daily and posted on Purina.com. Federal employees in need should refer to their nearest animal shelter for more details and to confirm availability. Pet welfare organizations that are not current Purina partners, but are distributing pet care products to federal employees impacted by the shutdown, can apply for a one-time donation at www.purina.com/about-purina/supporting-communities.